Part of PS DOORS' Flood Barriers™ line of products, the PD-522FFR is designed to specifically handle flooding concerns, with water-protective heights up to eleven feet. In addition, it withstands fire for up to 90 minutes, successfully meeting the 90-minute Positive Pressure Fire Endurance Test criteria per UL10C. It is also designed for hydrostatic, hydrodynamic and impact-loading requirements. The PD-522FFR features a compression seal that eliminates the need for compressed air to engage the seals, providing 24-hours-a-day protection against flood and fire while still allowing access to the facility. The PD-522FFR is available in both mild steel and stainless steel. It comes standard with access hardware and can be outfitted with controlled access door lever hardware. Vision Lite, louvers and kick plates are available to meet various building requirements. Single and paired swing door configurations are available. "Having experienced the incredible power of water firsthand during the devastating Red River flood of 1997, we know how critical flood protection can be," says Terry Smith, PS Flood Barriers National Sales Manager. "Now, we've taken our expertise in flood barriers and combined it with the latest fire prevention technology. As a result, I believe we've developed something truly special." 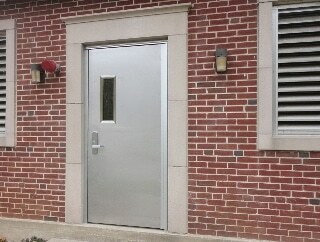 To learn more about the PD-522FFR Fire Rated Flood Door, call 877-446-1519 FREE or visit www.psdoors.com/fireratedflooddoor.